Photo courtesy of Angie Gibson Utz Galion head baseball coach Phil Jackson leads a meeting on the mound during MOAC action against the visiting Pleasant Spartans on Friday. The Tigers defeated the Spartans, as well as Willard and Colonel Crawford over the weekend to improve to 11-6 overall on the season. 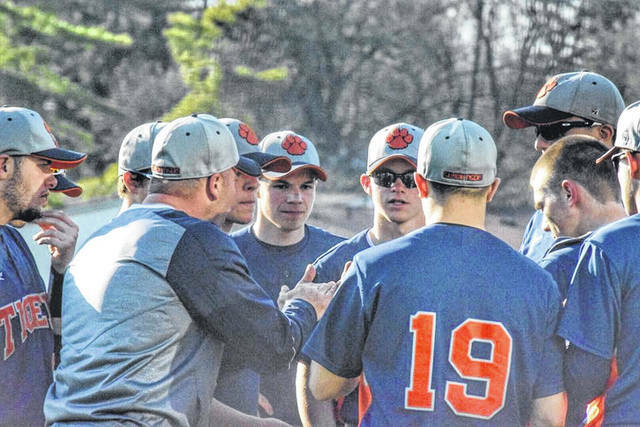 GALION — The Galion Tigers baseball team had themselves a busy, yet successful weekend. After their home victory in a makeup game with Pleasant on Friday, the Tigers would play in two contests on Saturday. Galion would stymie the Willard Crimson Flashes to the tune of 13-3 and shutout out the Colonel Crawford Eagles by a final score of 6-0 to earn three wins over the two day time frame. The Tigers now sit at 11-6 overall and 3-5 within the Mid-Ohio Athletic Conference. Against Willard, Clay Karnes would earn the victory on the mound, throwing four innings, allowing four hits, two runs (one earned) while walking three and striking out one. Troy Manring worked the final inning in the shortened game for the Tigers, allowing three hits and one earned run while striking out one batter. Aaron Barnhart would have an impressive game at the dish for Galion, going 3/3 with a pair of singles, a double, three runs batted in, three runs scored and two stolen bases. Ethan Pigg would rip a single and a double, en route to two runs scored in the victory. Spencer Keller, Cameron Payne and Chase Castline would also manage two hits apiece on the day, all singles. Galion would plate their 13 runs on 15 total hits, strand five runners on base and commit two errors in the field of play. For Willard, it was three runs on seven hits, all singles, eight left on base and no errors in the loss. Other offense for Galion came from: Ryan Utz- 3B, 2R, SB; Mitch Dyer- 1B, 2R, SB; Keller- RBI; Payne- 3 RBI, R, SB; Karnes- R; Kaleb Harsh- 1B, R and Castline- R, 3SB. Against the Eagles on Saturday, Galion would need just eight hits to plate their six runs as the duo of Markis Lawson and Carter Keinath held Colonel Crawford to just four hits over the seven inning contest. Lawson netted the win, going six innings and scattering just two hits while striking out seven Eagles batters. Keinath came on for the final inning, allowed two hits, walked a batter and struck out a batter. Payne had another big day at the plate for the Tigers, recording two singles, a double, a run scored and a stolen base for the Galion offense. Pigg would have the only other multi-hit game for Galion against Crawford, ripping two singles, plating a runner, scoring once and swiping a base in the win. Utz finished with a double, a run driven in and a run scored before being replaced by Wilson Frankhouse who also earned a single in one plate appearance. Dyer finished with a single, Karnes scored twice and Barnhart finished with two runs batted in, a run scored and a stolen base to wrap the offense in game two on Saturday. Galion will be back at home on Wednesday, May 2 to meet up with the conference leading Ontario Warriors. On Thursday and Friday, the Tigers will take to the road to play North Union and Pleasant, respectively. GALION — Back on Friday, April 27, the Galion Tigers welcomed the Pleasant Spartans to town to makeup a missed MOAC contest from earlier on in the season. The Tigers would go on to defeat their guests by a final score of 11-5. Picking up the victory on the bump for the hometown Tigers was Utz. Utz tossed 5⅓ innings for Galion, allowing seven hits, five runs (three earned), walked three and fanned two. Keinath worked the remaining 1⅔, allowing just one hit while walking a batter. Galion would score 11 runs on 10 hits, strand just three on the base path and commit two errors in the field. Pleasant finished with five runs on eight hits, stranded nine and had one error. Dyer, Karnes and Castline all delivered multiple hits for the Tigers offense on Friday. Dyer belted a pair of singles to go along with two runs scored and an RBI. Karnes also notched a pair of singles and scored once. Castline drove in two runs, scored once while belting a single and a double for Galion. Other offense from Friday’s win came from: Utz- R; Pigg- RBI, R; Barnhart- 1B, RBI, R; Keller- 1B, 2RBI, R; Manring- R; Payne- 1B, 2RBI, R and Keinath- 1B, RBI, R.
https://www.galioninquirer.com/wp-content/uploads/sites/38/2018/05/web1_Meeting-on-the-mound.jpgPhoto courtesy of Angie Gibson Utz Galion head baseball coach Phil Jackson leads a meeting on the mound during MOAC action against the visiting Pleasant Spartans on Friday. The Tigers defeated the Spartans, as well as Willard and Colonel Crawford over the weekend to improve to 11-6 overall on the season.